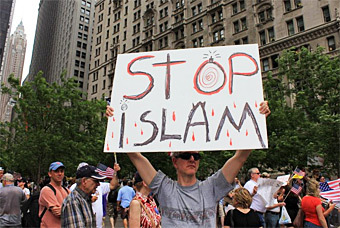 Anti-mosque fever is all the rage nationwide, not just in lower Manhattan. Everyone's doing it! And now the American Family Association, a religious right heavyweight, has taken it to a new level: no more mosques in the United States, period. Bryan Fischer, the AFA's Director of Issue Analysis for Government and Public Policy, has thoroughly analyzed this particular issue of government and public policy and come to the conclusion that mosques are dumb and should be banned. If a mosque was willing to publicly renounce the Koran and its 109 verses that call for the death of infidels, renounce Allah and his messenger Mohammed, publicly condemn Osama bin Laden, Hamas, and Abdelbaset al Megrahi (the Lockerbie bomber), maybe then they could be allowed to build their buildings. But then they wouldn't be Muslims at that point, now would they? What a character. Palin/Fischer '12!